Citrus arrives in the nick of time, as the best season to enjoy the vitamin C boost is in the deep, dark winter months when sunlight is at a minimum. I often wonder how many know that oranges and lemons are seasonal? We are so used to seeing fruit and vegetables of all different varieties all through the year, we forget there are actual seasons to enjoy produce at its best. While we love welcoming the many customers who walk through the doors of our shops it is not always possible to visit London for those who live outside the metropolis. With that in mind, we’ve developed our website to give readers an insight into what La Fromagerie is all about, and posting up stories and pictures is a way of letting you into our wonderful palette of produce. January seems fitting to include oranges and lemons as we are making Seville Orange Marmalade all the time at the moment, and also Confit Lemons. 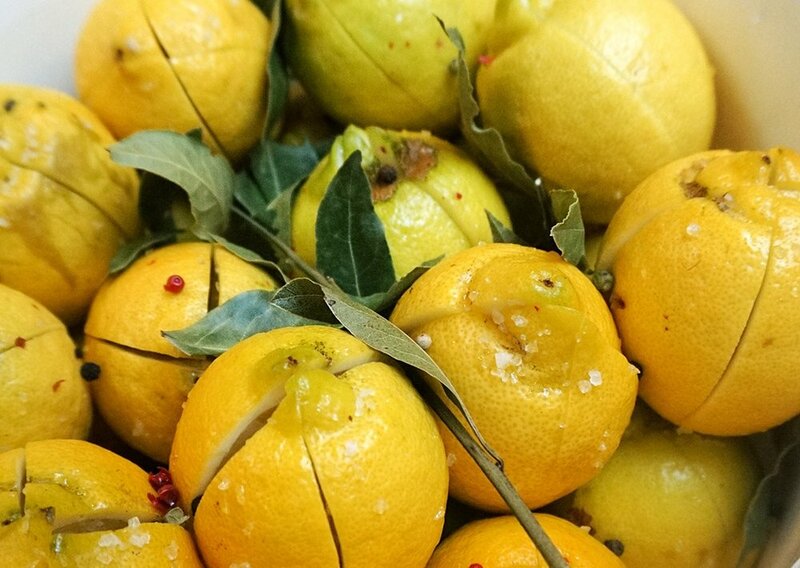 Preserving lemons is a long-held tradition in Mediterranean and North African countries and their recipes and simple side dishes are truly invigorated by the zing of flavours. Adding a chopped confit lemon to a bowl of olives and shaking over your favourite olive oil elevates a simple appetiser into a special treat. Then perhaps add a few cubes of feta tossed in mint and thyme and you will be instantly transported to the magical islands of Greece and Cyprus you may have visited one summer - even if you are sitting at the kitchen table in the dead of winter. Food is often memories, and flavours remind us of places and events. Use untreated lemons – ones that have not been waxed as coated ones will not work with a traditional recipe like this. The salt should be coarse, natural sea salt – I always use a Sicilian organic rough seat salt. Lemon juice should be freshly squeezed and please be sure to do something with all the lemon ‘shells’ – such as candy the rind or grate the lemon zest to sprinkle over grilled fish or add to a cream cheese dip or a lemon cheesecake. If you can buy freshly squeezed lemon juice then by all means use this. I like to add bay leaves and peppercorns to my bucket of lemons – if you fancy doing that too then get the most fragrant peppercorns you can find. We love the Sri Lankan black peppercorns as they have such a wonderful fragrance or mix up pink, green and black peppercorns. Try first with say 6-8 lemons and see how you like using them before committing to a larger quantity. Cut through the lemons into four ‘petals’ so that you can gently prise them apart without actually slicing all the way through. Sprinkle in a good pinch of sea salt and stand the lemon upright into a wide necked jar. Make sure the jar is sterilised before starting – you can place the jar in boiling water for 5 minutes and place the lids you are going to use to seal the jars into the pan too (or place the jars and lids in a pan of boiled water in a hot oven for 5- 10 minutes) - take out of the pan shaking off the water and completely dry with paper towels. 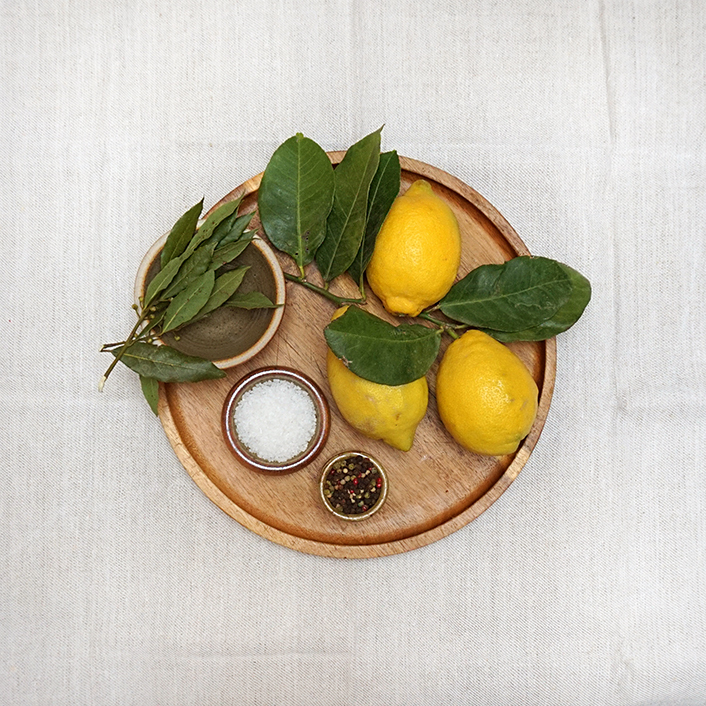 Layer up the lemons in the jar and sprinkle over a little extra sea salt, one or two bay leaves and a teaspoon of peppercorns. When you have reached the top and the lemons are firmly pressed into place, pour over the lemon juice to cover and top with a few more bay leaves and peppercorns and a sprinkling of salt. To make sure the lemons are submerged into the juice - you may need to place a plate or paper on top with 'baking beans' to weigh down the top lemons. Screw on the lid to seal and keep in a cool place – a cold windowsill, outside the back door in a box, in your cellar – you don’t need to keep in the fridge if you are making this in winter. Check your jar every week to see if the liquid needs topping up although it should be ok. After 4 weeks your confit lemons are ready to use. The jar will last for months so if you have reached summer and still have some lemons then do keep the jar in a cooler place like the fridge. Remember to shake off and rub all the salt from your lemon before using in a recipe. There are many ways of using them – like the olives and feta already mentioned. But also tagines – the wonderful Moroccan casserole made with chicken, lamb or even fish. I love roughly chopping a lemon and putting some inside a roasting chicken as well as in the roasting pan together with whole cloves of garlic (lots of garlic which will roast in the chicken juices); I rub the chicken inside and out with olive oil and stuff a bunch of fresh herbs such as thyme, parsley and rosemary into the chicken as well as a clove or two of garlic, then sprinkle over the chicken skin a couple of good pinches of sea salt crystals crushed between my fingers before a final squeeze of lemon all over the chicken. Cooking the chicken lightly covered in foil for an hour (in a medium hot oven 180-200 C on the middle shelf) and then taking off the foil to crisp up the skin for another 20-30 minutes depending on the size of your chicken. Bring the roasting pan to the table and serve with the roasted lemon confit and garlic cloves – spooning up the juices to coat each plate. But maybe my favourite dish is a winter salad of bitter leaves such as Radicchio Tardivo, Rosa Simone, Castelfranco, Endive - all at their best during those dark and most dreary months; and so vibrantly colourful. Roughly torn onto a shallow serving dish and then mixed and tossed with finely shaved fennel, chopped confit lemons, dill and mint and a good dousing of a peppery Tuscan extra virgin olive oil and a few grindings of black pepper. This salad is perfect alongside grilled fish or lamb chops, but even better with a fresh goat cheese, Buffalo Mozzarella or creamy Burrata.